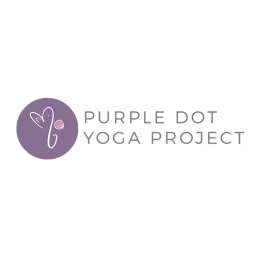 Purple Dot Yoga Project is a nonprofit organization whose mission is to support and empower individuals affected by domestic violence and trauma using yoga as a healing tool. PURPLE is the color of domestic violence awareness. Purple is also the color associated with the crown chakra, our conscious center used to communicate with our spiritual nature. Purple is also the color of royalty and respect. Our aim is to connect to our highest self and in doing so demand to always be treated with respect! DOT signifies an end, like a period at the end of a sentence. Full stop. No more. We wish to eliminate violent and manipulative behavior that stifles true growth and healthy love in relationships. YOGA is used as a tool to get out of the mind and check into the body to release trauma and reconnect to our inner strength. Yoga is what we bring to the table. It’s the tool we share with our community and our tribe to assist in the healing process. A PROJECT in motion. To represent, always, a work in progress. As an individual, as a movement, as a cause.